I know that Kameron Hurley is among a new wave of writers much-lauded for originality and story-telling prowess. 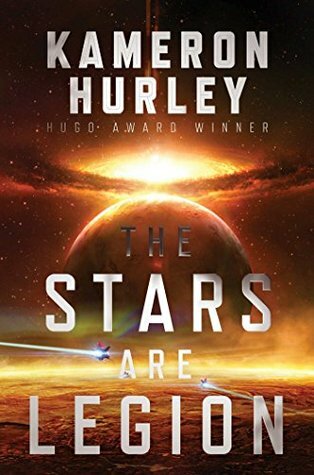 I’ve only read two books by Hurley before this, with mixed reactions to both. Here, somewhere in deep space exist a series of world-ships that have been at war with one another for hundreds of years. From the war(s) and basic neglect, the world-ships are decaying and soon to be at a point of no return if something isn’t done about it, but most are too busy fighting to give the worlds themselves much thought. Anat, the leader of one war-torn ship, and a feared fighter, wants peace and so she offers her daughter in marriage to a rival. That daughter, Jayd, is also a feared fighter and had hoped to lead the armies in her mother’s name to victory. Now she’ll be a consort to the enemy. And so Jayd pins her hopes on her sister, Zan (a pacifist), to lead the world’s best fighters to victory. The opening sentence… then the opening paragraph … then the opening chapter, took my breath away. Hurley drops us into the action, leaving us to figure out what’s happening while we’re on a wild ride. These warriors appear to come back to life after dying in fierce battles, though their memory of events prior are often lost and slow to recover and it is up to those around them to usher them back into their old lives. Aside from giving us an exciting ride the moment we open the pages, Hurley provides us with a glimpse of the world-building that she’s creating here and we immediately know that the rules are different here. It’s a brilliant set-up and Hurley does this as well as anyone in the business. The book is told from different points of view. Sometimes Zan and sometimes Jayd. This is not a device that I enjoy, and it is made a little more challenging here because the chapters don’t alternate on a regular interval. While Hurley is really spectacular at getting our attention and bringing us into her very unique world in the early goings of the book, I find that she often lets me down in the middle portions. I get bored and tend to feel I am getting a great deal of repeat story. I stopped caring about Zan and Jayd for a bit but then got back into it as we neared the end. This is not unique to this book as I’ve felt this way with other Hurley novels as well. Looking for a good book? The Stars Are Legion by Kameron Hurley shows us why Hurley is an exciting fantasy author, but the story does drag for a bit in the middle.